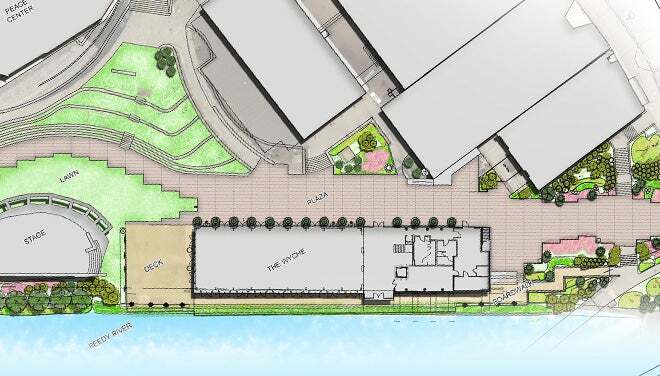 Greenville, S.C. – The Peace Center will meet with the City of Greenville’s Design Review Board on Feb. 7 to present a proposal for restoration of the Wyche Pavilion. Peace Center President and CEO Megan Riegel has spearheaded the project, along with the Peace Center’s Executive Committee, and Keith Summerour of Summerour and Associates. The restoration furthers the mission of the Peace Center by creating a new performance and event space, serves the community by enhancing the connectivity to Falls Park, and preserves a building with historical significance to the city. With designs by Summerour and Associates, the existing shell of the building will remain intact and be carefully preserved. The addition of windows and doors, ceiling fans, and HVAC will allow for year-round use. A two-level expansion featuring a grand foyer, an artist green room, meeting spaces, restrooms, and a kitchen will be added alongside the current building footprint. The Wyche will be outfitted as a fully-functioning performance venue, featuring state of the art sound and lighting equipment. The open floor plan will allow for a variety of configurations, from cabaret to concert-style seating, to a standing-room-only club space. 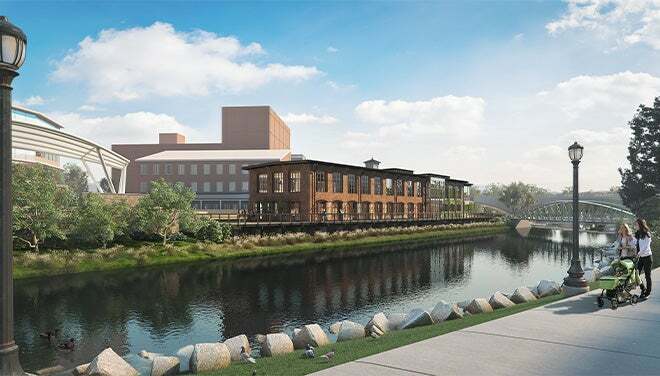 In addition to the grand entryway which overlooks the Reedy River, the new structure will support significant catering and back-of-house operations, positioning the Wyche as an ideal year-round event space in the heart of downtown. 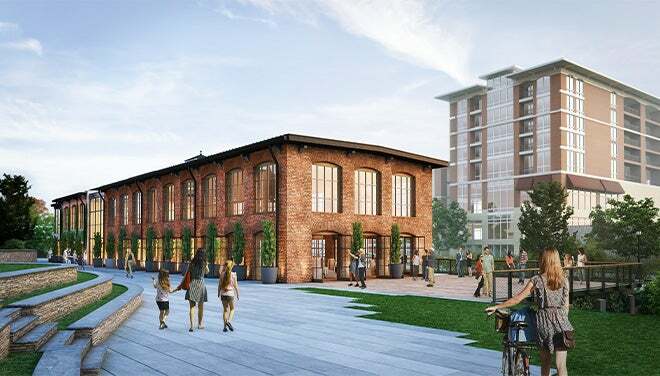 Buildings on this site along the Reedy River have a nearly two-century history and made up the city’s largest industrial complex. A two-story wooden structure was built in 1835 as part of the original Greenville Coach Factory. 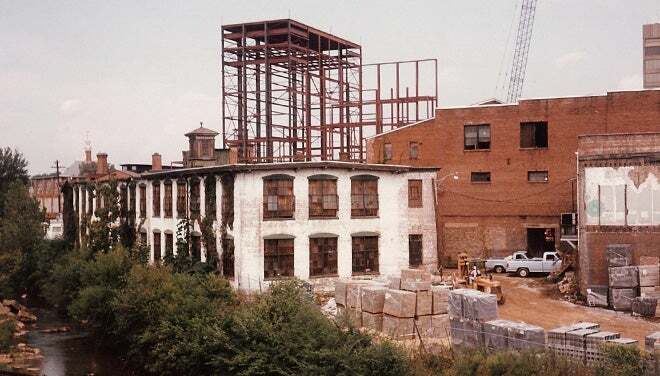 The brick building known today as the Wyche Pavilion was built next to the wood building in the early 20th century to serve as the paint shop for the factory. While the wood building is no longer present, the Wyche Pavilion was re-purposed. In the mid-1920s, Eugenia Duke purchased and modified the building, creating offices and a space for the production and packaging of Duke’s Mayonnaise. The building had been abandoned since the 1950s and had fallen into disrepair when it was purchased by the Peace Center in the late 1980s. The Peace Center intended to restore the building as part of the initial campus development; however, financial constraints prevented those plans from coming to fruition. Instead the building was reduced in size, gutted and turned into the open-air pavilion that exists today. It was named the Wyche Pavilion in honor of Tommy Wyche, a Greenville native who was instrumental in the transformation of the downtown area. 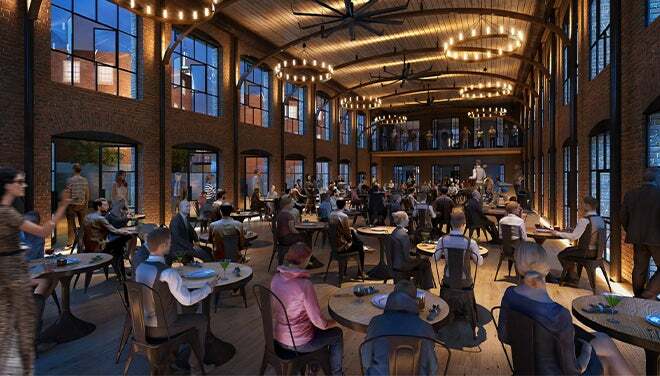 The Wyche restoration is the first phase of the Peace Center’s larger master plan, which includes renovation of the Roe Coach Factory and two buildings located on Main Street: the Markley and the Gullick. The not-for-profit Peace Center is located on a six-acre site along the Reedy River in downtown Greenville, taking up the triangle between Main and Broad Streets and the Reedy River. With the 2,115-seat Peace Concert Hall, 439-seat Gunter Theatre, outdoor TD Stage, and Genevieve’s theater lounge, the Peace Center is the hub of cultural life in Upstate South Carolina. The organization has a history of restoring historic buildings on the site, while adapting them for modern use. 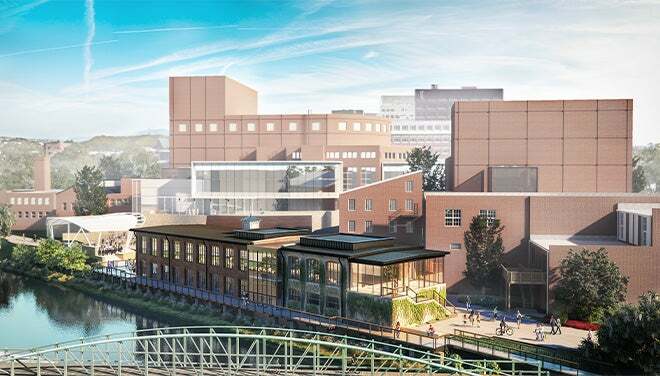 The Huguenot Mill today houses administrative offices, meeting, education and event spaces, while the Roe Coach Factory, Markley, and Gullick buildings are currently leased, providing homes for key businesses in downtown Greenville.